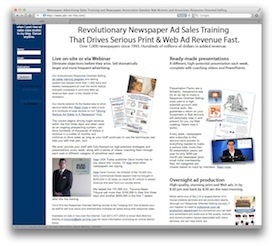 Driving Serious Newspaper Ad Sales: Join me in Michigan for 2013 ADCON! Join me in Michigan for 2013 ADCON! I'm thrilled to be leading a full day of workshops and panels. Join me on September 27th at the Lexington Hotel in Lansing, MI, where we'll be discussing how to tie print and digital and social media together for bigger ad sales! For more info on the sessions, click here. Ad Sales Face to Face For new and veteran ad reps alike (as well as the publishers and ad directors who manage them), Bob McInnis will share powerful techniques to getting prospective advertisers running and running larger and more frequently than ever imagined. New approaches to every step of the sales process will be discussed as well as overcoming today’s most difficult objections. Techniques will apply to both print and digital. Prospecting for Gold, Silver and Green There’s major revenue hiding in plain sight in your market, you just need to be able to recognize it. Bob McInnis and a panel of newspaper pros will show you exactly where it is and how to get it. Techniques will apply to both print and digital. Using Social Media to Tie it All Together As consumers change how they buy, local businesses are responding by putting too much emphasis on social media and too little on print and digital advertising. Learn how to help your prospects improve the way they use social media and, in the process, they’ll recognize why print and online advertising needs to be a major part of their marketing effort. Whether you’re trying to get your fair share of print and digital or you want to start offering social media services, this session by Bob McInnis will get you off to a great start. Click here for more info and the full schedule of workshops. Hope to see you all there!